The impacts of climate change are being felt all around the world and as they become more damaging and widespread, it is the 2.7 billion people who live on less than $2 a day who will be hit first and hardest. Changes in patterns of rainfall and river flow, more flooding and drought will make the livelihoods of poor people more and more precarious. And as the numbers of people at risk of hunger grow so will the incidence of infectious diseases. Lament is not good enough--we must take action. Based on analysis of the evidence for climate change and the vulnerability of poor people, Just One Planet makes clear the link between consumer and political choices in the North and impacts in the South. It advocates both mitigation—to reduce the severity of climate change now and in the future—and adaptation—to increase the ability of poor people to survive climate change impacts. And it offers a plan of action: advice on how to mitigate climate change, suggestions for policy changes and examples of projects already in process. 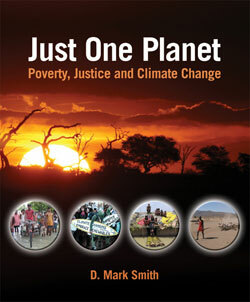 An indispensable reference for NGOs, government policy advisors, researchers, students, and specialists in the areas of development, climate and environmental studies, Just One Planet is also a call to arms for anyone who cares about the only planet we have. About the Author: D. Mark Smith was leader of the Livelihoods & Environment Research Group at the CSIRO Sustainable Ecosystems in Australia and is currently Water Management Adviser at IUCN. 1) Introduction: Global challenges to planetary welfare; 2) Poverty and vulnerability; 3) Climate change and impacts on poverty; 4) Mitigation of climate change; 5) Reducing vulnerability to climate change: Adaptation; 6) International policy on climate change; 7) Framework for action on climate change and poverty reduction; Appendix I: Regional summaries of climate change impacts.